So presidential candidate Meral Aksener is going from town to town collecting these colorful pieces of cloth, known as "yemeni," from her supporters.The 61-year-old is leading what she calls the yemeni revolution to bring an end to the aggression of Turkish politics. If she becomes the one to finally end President Recep Tayyip Erdogan's long reign, she will put the headscarves on display in Cankaya, the former presidential palace in Ankara. "Turkey has been ruled by a very harsh male for a very long time," she told CNN in the southern city of Adana, on the campaign trail.Some abroad call Aksener Turkey's Iron Lady, but others at home call her Asena, a mythical blue she-wolf that led Turkic tribes away from danger. But there are other names she prefers. "Some people call me sister, but there are many young people who call me 'Mother Meral,' and I like being a mother," Aksener said.Aksener is the only woman running for president in the June 24 elections, but her appeal is not based solely on her gender. Her conservative and longtime nationalist credentials are what make her most likely to lure support from Erdogan's base, even though she polls third. The main opposition candidate, Muharrem Ince, is in second place and has galvanized his own center-left base. But he is unlikely to split the conservative vote in the way Aksener can. 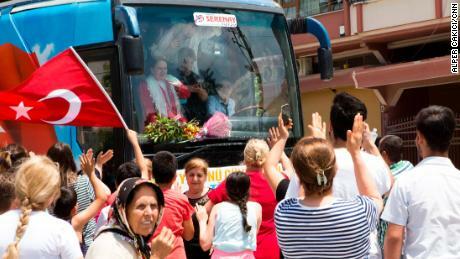 Aksener and her envisaged revolution have been drawing crowds across Turkey. Women at the Adana rally eagerly handed their headscarves up to the candidate on stage. Esra Demirkol, a fervent supporter who waited for hours to get a photo, jumped on stage to hug the candidate. "For the future, for our kids, for our country for many reasons, I will vote for Meral Aksener. A woman's touch makes everything better. I want a mother to rule our country," said a breathless Demirkol as she returned from stage. Aksener's Iyi Party (Good Party) is new to the political scene, but Aksener is a veteran politician. She served as interior minister for eight months at the height of the dirty war against Kurdish separatists when human-rights abuses were rampant in Turkey. When questioned about those allegations, Aksener is defiant, claiming there was not a single human-rights violation by the government during her time as minister. "There was a human rights group at those times, they were publishing lists for missing people. I sent them a signed paper saying, 'Let us search for your missing together.' And they did not have any other publications for the rest of my ministry period," she said. But during her stint as interior minister, she also gained credibilty for standing up to the military, which tried to overthrow the civilian government in the 1997 so-called "post-modern coup. "Once again, it is her defiance that is fueling her popularity — Aksener broke with her longtime Nationalist Movement Party, MHP, last year over its alliance with the President. 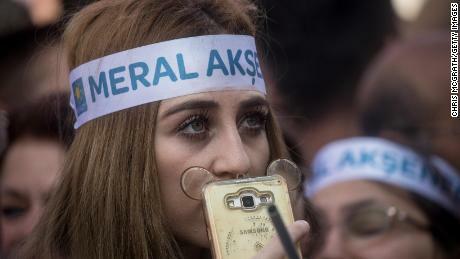 Aksener, like all the opposition candidates, has vowed to roll back a change to Turkey's political system that Erdogan won last year in a referendum.He was widely accused of a power grab with the vote, in which he sought to change the country's parliamentary system to an executive presidential one, giving himself sweeping new powers. The vote was seen as unfair, as his government has imprisoned dissidents and crushed the free media following a failed coup in 2016. He won by a narrow margin, and a radical change to Turkey's system will come into effect after the election. "I have been struggling with Erdogan and his extrajudicial behavior for the last two-and-a-half, three years," Aksener said. "The elections we are going into, it is what Erdogan wants. It is not a presidential system as in Western democracies. We do not have checks and balances." With Ince polling second, Aksener may not be the opposition candidate to face off against Erdogan, should the vote go to a run-off round. But she has already been instrumental in shaping this election. In the previous presidential vote, opposition parties banded together to back a single candidate to challenge the incumbent. This time around, Aksener refused to join and announced her own candidacy. Soon other opposition parties followed and put forward their strongest candidates, giving more options for people to vote against Erdogan.Opposition parties including Aksener's have committed to support whoever faces off with Erdogan, should the vote go to a second round. Mustafa Koseler, a 76-year-old supporter of MHP, Aksener's former party, will back the Iyi Party after decades of loyalty. He fears that Turkey will end up a "one-man dictatorship like Bashar Assad, like Hafez Assad, like (Mohamed) Morsy, like (Moammar) Gadhafi" under Erdogan's rule. He is looking to Aksener to preserve the country's democracy and prevent the change to Turkey's political system. 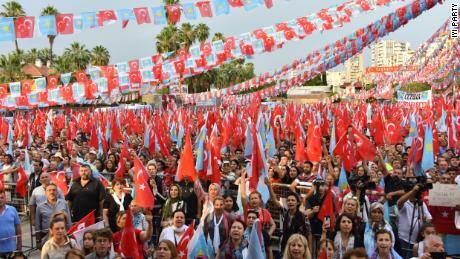 "We do not want one-man rule," he said at the rally in Adana. "We want our republic, democracy and parliament to function as it is today. We want our members of parliament to have a say. In the new system, they won't. "What Aksener is promising is a new dawn for her country. Her Iyi Party's blue logo is emblazoned with a golden sun, promising the optimism of a new movement. When voter Guler Yasa in Adana is asked why she supports Aksener, she refers to this logo. "Because she is turning her face to the sun. She will make a new sun rise over our country," Yasa said.